Becky Knows Everything: Afterprom, Oh What a Night! Did you ever think about how the weather affects your mood and your thought process? It is mid May and today in upstate New York we are having a clear, pretty day. We have had a tough winter and are eagerly anticipating the warm weather. When I think of spring, my mind often goes to my kids’ high school years and the work the parents did on “afterprom.” Each year there would be a different theme and our high school would be transformed. It was an event designed to provide a fun place for the students to come after the prom – you know instead of going to a hotel room and drinking alcohol supplied by someone’s older sibling. The first year our theme was old movies and we were assigned “Blazing Saddles.” I collected my friends and we gathered everything we could think of to transform our small classroom into a western diner. Hosting a “food room” was the most fun since the kids were always hungry which meant we were busy all night – and I mean all night since the event ran from midnight until 5:00 a.m.
With my design background and my love of telling other people what to do, I always was the room leader. We decorated the entire lower half of the room with cardboard drapery tubes to simulate logs. On the top half, we hung western artifacts, including a map of the West my friend Sue and I made in my garage. We burned the edges to make it look authentic (like the opening of that old show Bonanza) and both my garage and Wyoming almost went up in smoke. 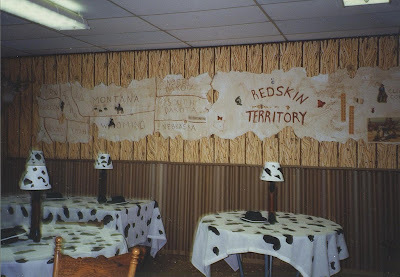 Our tablecloths were white sheets painted to look like “cow hide” with black splotches of paint we applied using a potato dipped in paint. 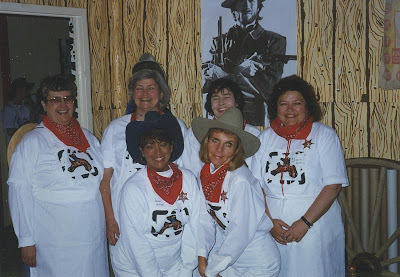 I made us aprons with stenciled horses and we all wore cowboy hats and kerchiefs too. The following years included rooms done up like Italy (countries theme) and a wedding reception (special days theme). I think the concept of “afterprom” still exists and I am sure the parents still enjoy it even more than the kids.I know it is prom season - so if you are in the mood for reminiscing, send your prom stories to beckybarras@hotmail.com or leave a comment on the blog. *Becky Knows Everything: Our menu included pork spareribs and coleslaw. Find the recipes in an upcoming blogs.